I work on a subject called quantum field theory. Below is a brief description of what that means, together with a number of projects that I've been involved in. Quantum field theory is the language in which all of modern physics is formulated. It is the result of the marriage between quantum mechanics and locality, with the latter usually imposed by invoking special relativity, and provides the mathematical framework in which to describe the creation and destruction of hoards of particles as they pop in and out of their ethereal existence and interact. 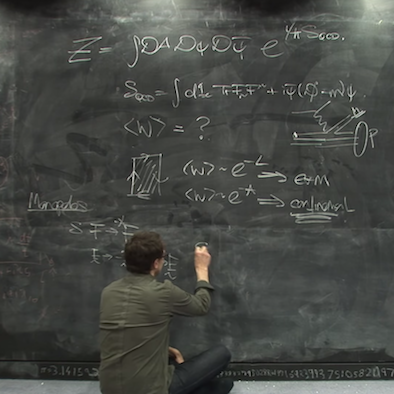 Whether you want to understand the ultimate building blocks of Nature, how teams of electrons co-operate inside solids, or how black holes evaporate, you need to work with quantum field theory. Moreover, it has also proven to be a remarkably subtle and rich subject for mathematicians, providing insights into many new areas of mathematics. You can read more about quantum field theory here. Over the years, I've applied ideas from quantum field theory to a number of different topics, including particle physics, gravity, string theory, cosmology, condensed matter physics and geometry. Here's a description of some of these projects. Often, two very different looking quantum field theories actually describe the same underlying physics. This is a phenomenon known as duality. Although well established in supersymmetric theories, it is much harder to demonstrate dualities without the crutch of supersymmetry. In work with Andreas Karch, we found evidence for a web of dualities in d=2+1 dimensions. This work was motivated by a wonderfully diverse collection of ideas coming from high energy physics and condensed matter physics, including supersymmetric dualities, higher spin theories$ the half-filled Landau level, and interacting topological insulators. This work was highlighted in this article. A talk on this topic can be found here. Black holes are objects in which gravity is so strong that nothing, not even light, can escape. There is much that we don't understand about black holes. In recent years, there has been a lot of progress in extracting some of their properties using a framework known as gauge-gravity duality. Together with a number of collaborators, I showed how the horizons of black holes conduct electricity. There are some surprising similarities between black holes and a mysterious class of materials called strange metals and we hope that this work will ultimately teach us about both black holes and strange metals. This work was highlighted in this article. A talk on this subject can be found here. 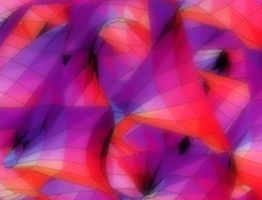 Quantum field theory and string theory offer a way to generalise basic mathematical ideas of geometry and topology so that space becomes blurry at small distance scales. This has resulted in a number of dramatic new developments in mathematics, prominent among them the idea of mirror symmetry which relates the properties of very different looking spaces known as manifolds. Kentaro Hori and I showed how to solve a class of quantum field theories to give "physics proofs" of a number of conjectures in the mathematics literature. The field theories we solved were non-Abelian gauge theories in two spacetime dimensions and are related to non-toric Calabi-Yau manifolds. My paper with Kentaro can be found here and the slides from a talk on this subject can be downloaded here. 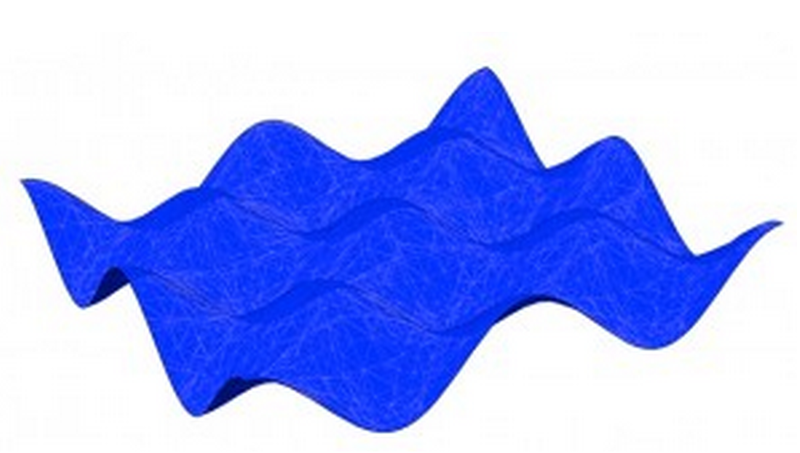 Mathematically, solitons are solutions to tricky non-linear equations. 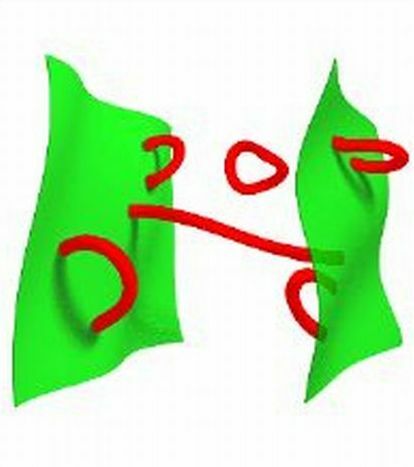 Physically, solitons are new objects that appear in a system due to the cooperative behaviour of the underlying constituents. A familiar example is the vortex that forms everytime you flush the toilet or pull the plug in the sink. The vortex appears as an empty region around which the water molecules swirl. In a zen-like manouevre, physicists consider the absence of water in the vortex as a new object in its own right and study its properties. I've written many papers on the properties of different solitons, including monopoles, vortices, instantons and domain walls. Usually my interest lies in their quantum interactions. In particular, Ami Hanany and I discovered a new kind of vortex in Yang-Mills theories (the theories which underlie much of particle physics). 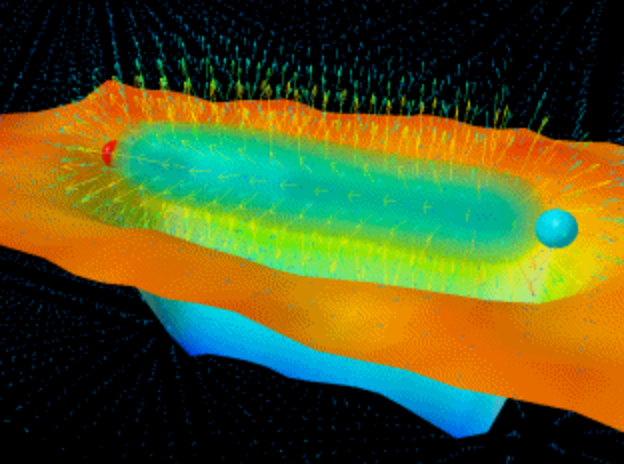 The dynamics of these vortices provides a new window into questions in quantum field theory. I made a short video on vortices which can be viewed here. My lectures on solitons can be found here. A review of the quantum dynamics of vortex strings can be found here. String theory is a framework which combines quantum mechanics and gravity. It offers our best hope to unify all the forces of Nature. String theory also provides new and surprising perspectives on quantum field theory. You could think of string theory as a subset of quantum field theory. One rather lovely fact is that, with a change of perspective, you can also think of quantum field theory as a subset of string theory! Most of my work on the subject has used string theory as a tool, rather than thinking of it as the underlying theory of our world. I have also written a number of papers exploring the structure of string theory, including a proof of the duality between branes and geometry. My introductory lectures on string theory can be found here. 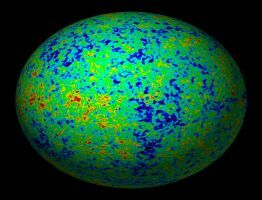 There is strong evidence to suggest that in the first few fractions of a second after the big bang the Universe underwent a very rapid period of expansion, known as inflation. Together with Eva Silverstein and Mohsen Alishahia, I suggested a mechanism underlying inflation which arises from string theory and extra dimensions. This is now known as DBI inflation. Importantly, this process predicts a distinctive pattern for the ripples in the fireball left over by the big bang. So far, there's no sign of our predicted signal in the data. Perhaps we need finer measurements, or perhaps this process simply didn't happen. But the fact that it's possible to generate such signatures at all has resulted in a great deal of excitement among both theoretical and observational cosmologists. If such a signal is found, we would be able to push back our understanding of the Universe to much earlier times. The original papers are here and here. © David Tong, d.tong@damtp.cam.ac.uk. The picture of the rippled black hole horizon is by Jorge Santos, the d-branes by Steuard Jensen, the flux tube by Derek Leinweber, the Calabi-Yau by Andrew Hanson and the CMB by Wmap.